With a clever play of literary and stylistic references, the Belle chair is the delicate, feminine counterpart to the Bull table. With rounded lines and padded seat with leather upholstery, it reinterprets the detail of the rounded section of the table legs, and as it develops downwards adds a small element of curvature that creates a graceful touch. 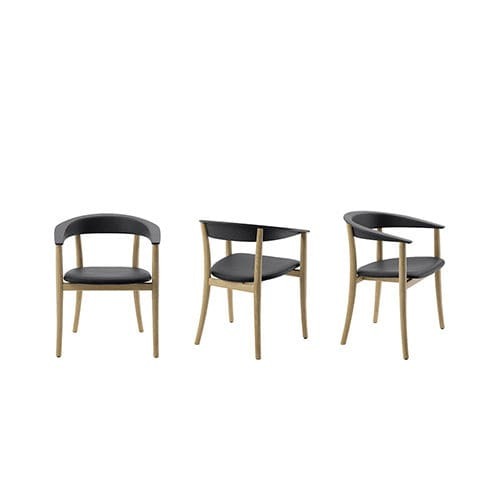 Towards the top, the legs join the chair back with elegant, elbow-shaped arms. Two solutions are offered for the backrest, oak wood in the same finishes as available for the frame - light, grey, black and smoked - or leather upholstery matching the seat, obtained thanks to a special manufacturing technology.